Like so many people in the Lowcountry, the GlassEco team is very passionate about doing our part to protect our area’s beautiful land and waterways. 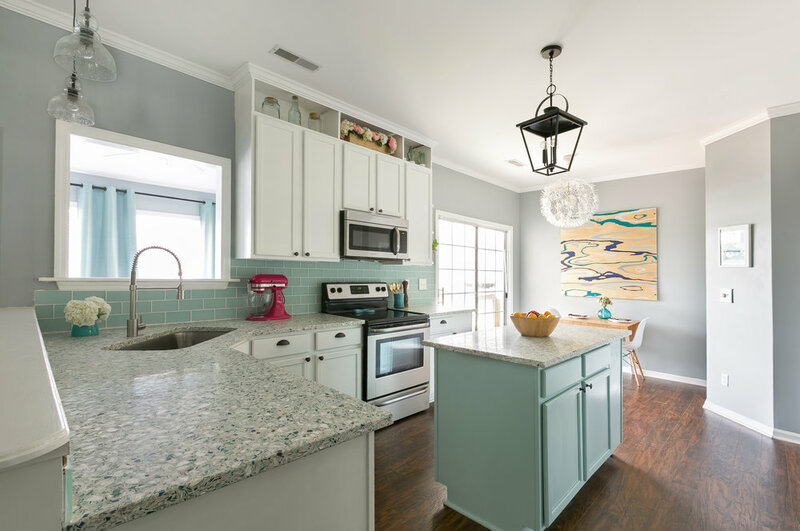 We manufacture one-of-a-kind countertops and other hard surfaces using recycled glass that has been collected from Charleston metro businesses and residences. The inspiration for our unique product line was an answer to a growing problem in the recycling industry that we are all too aware of, but many people in the region simply are not. Our goal is to shed some light on this important topic. Where Does Your Recycled Glass Really Go? When I recycle a beer bottle, does it secretly end up in the landfill? While these articles aren’t South Carolina specific, our state is dealing with the same problems regarding glass recycling. In fact, much to the dismay of our friends in the Upstate, they are no longer able to recycle their household glass through the cities or counties because there are simply no longer any local materials recovery facilities (MRFs) that accept glass. We do know of one business that is collecting glass for both residential and commercial in the Greenville area, RAM Recycling, LLC. Glass is heavy which makes it costly to transport. When paper, plastic and glass are all together in one bin, the glass tends to break which contaminates the other recyclables. It is very difficult and costly to sort them back into a reusable state. Glass fragments can damage recycling equipment, so facilities have to be willing and able to invest in glass-separating technology. If companies can’t process and sell glass profitably, they have no incentive to recycle it. As for those of us living in the Lowcountry, Charleston County states that they recycle your glass on their website. However, we are partial to our local sister company, Fisher Recycling. They offer recycling services for local offices, restaurants, hotels and some residential collection sites. We know first-hand that they take great care to pull out the glass so that it doesn’t end up in the landfill. Charlestonians go through a lot of glass as seen below, and we are thankful that we are able to re-purpose what Fisher Recycling collects through GlassEco Surfaces. Piles of glass at Fisher Recycling/GlassEco’s North Charleston facility that’s been diverted from landfills. While the glass recycling industry as a whole is full of serious challenges, we were encouraged at a recent conference to hear of new advances in the collection and processing of glass. There are development plans in the works for a state-of-the-art facility coming to Berkeley County that would handle all waste, except glass. Fisher Recycling is in discussions with them to manage all of the glass that comes out of the facility and recycle it properly. 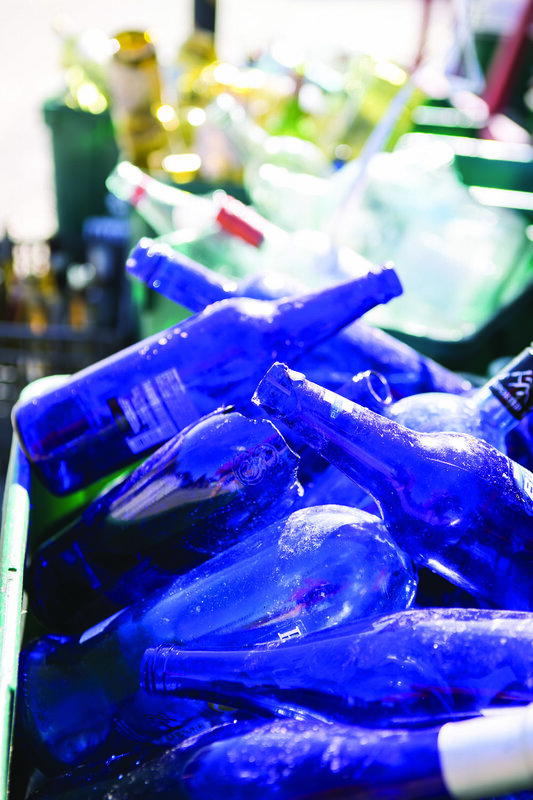 Consider heading up a glass recycling effort in your neighborhood or at your office. We would love to answer questions and may be able to facilitate a collection site in your area based on demand. Look for ways to re-purpose your own glass versus throwing it in the bin. We are in love with some of these ideas on Pinterest! Support local businesses like GlassEco that are actively collecting used glass to manufacture beautiful products. 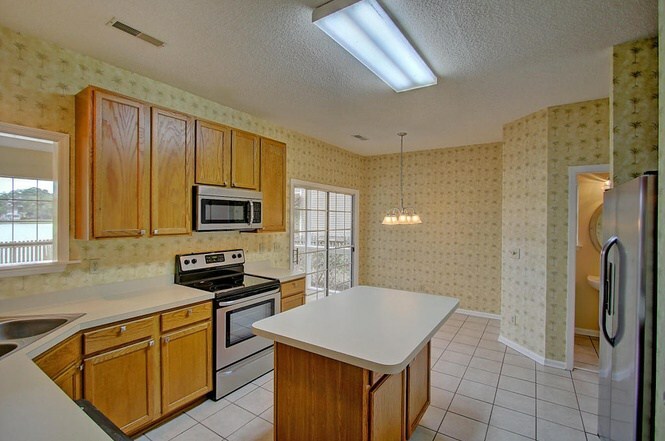 Recycled glass countertops and other hard surfaces are great for residential and commercial spaces, and GlassEco manufactures options that are well-suited for interior and exterior use. The design possibilities are virtually limitless, and it all starts with creating a custom sample. Schedule a complimentary design consultation to learn more. We often describe our recycled glass surfaces as Sustainably Stylish & Uniquely You. The sustainability factor speaks for itself, but the unparalleled versatility of recycled glass makes it particularly unique... Unique in that it is different from more traditional interior and exterior finishes, and unique in that it can be personalized in any number of ways. 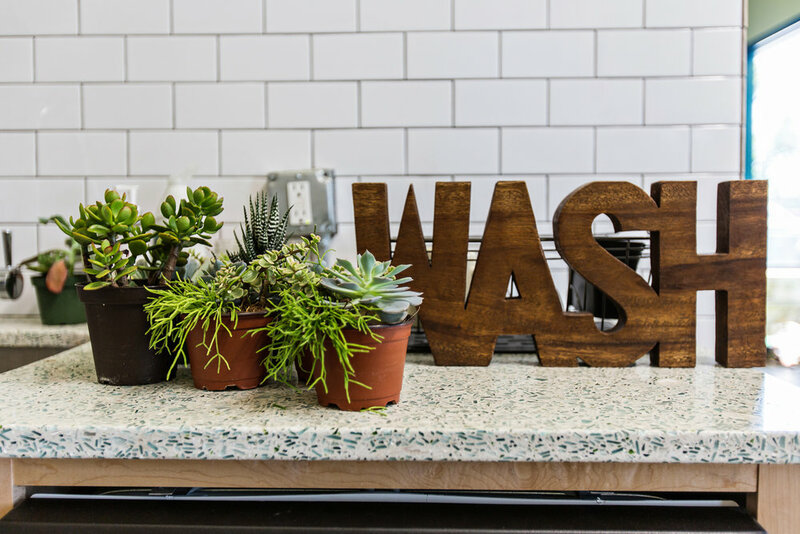 Personalization is extremely important to consumers who are customizing residential spaces, but public spaces can be surprisingly personal too. 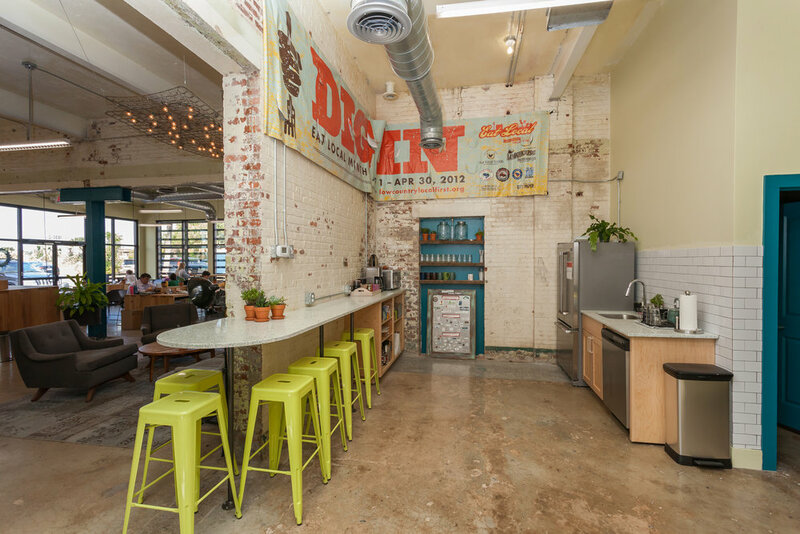 In 2014, GlassEco teamed up with Lowcountry Local First (LLF), a Charleston-based nonprofit that advocates for local businesses and farmers, to help outfit their new coworking space, Local Works. When Local Works opened its doors at 1600 Meeting St., it wasn’t Charleston’s first or only coworking establishment, but it was one-of-a-kind in its commitment to locally-owned businesses… To utilize the Local Works space, business operations must be locally and independently owned (no national chains or satellite operations), so it was only natural that the Local Works space would be a uniquely local representation of its intended tenants. The Urban Electric Company and Rewined are both Charleston-based businesses and active members of Lowcountry Local First. Jamee was able to incorporate recycled glass from both—wine bottle remains from Rewined’s candle packaging and glass refuse from Urban Electric’s light fixture manufacturing process. These materials were mixed with other glass cullet options to compliment the Local Works color scheme. Hailey and the LLF team had already selected a color palette of greens and blues for the Local Works space, and with so many recycled glass options to choose from, picking colors from GlassEco’s selection was a simple process. 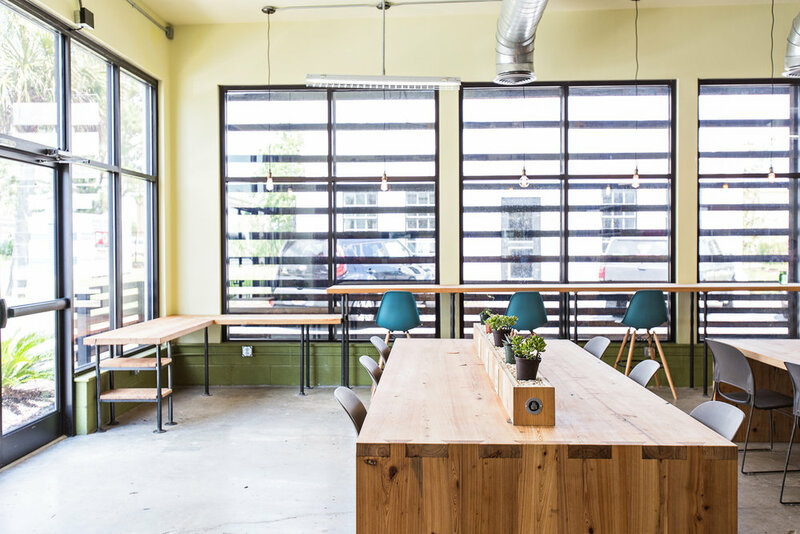 A variety of other locally manufactured products were used to outfit the Local Works space, including community tables by Perrin Woodworking. These were made with reclaimed wood from the old Limehouse Produce warehouse, and they certainly add depth and warmth to the industrial interior (designed by David Thompson) and recycled glass surfaces… Don’t you think? As of 2017, Local Works is a fully functioning office space and home to 45 local entrepreneurs. Visit LocalWorksCharleston.org to learn more about resident businesses, amenities and leasing options. 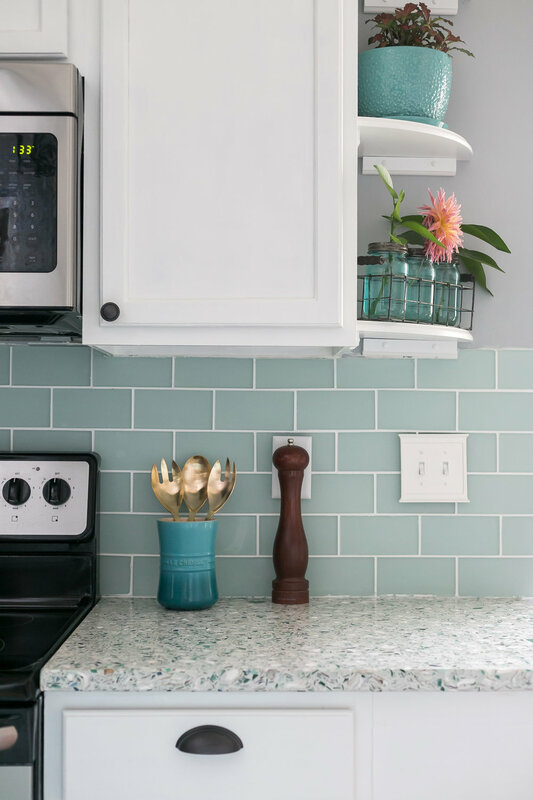 Recycled glass countertops are great for commercial and residential spaces, and GlassEco manufactures options that are well-suited for interior and exterior use. Surfaces can be customized in any number of ways, just like the Local Works project… Own a brewery? Incorporate glass refuse from your bottling process or tasting room. 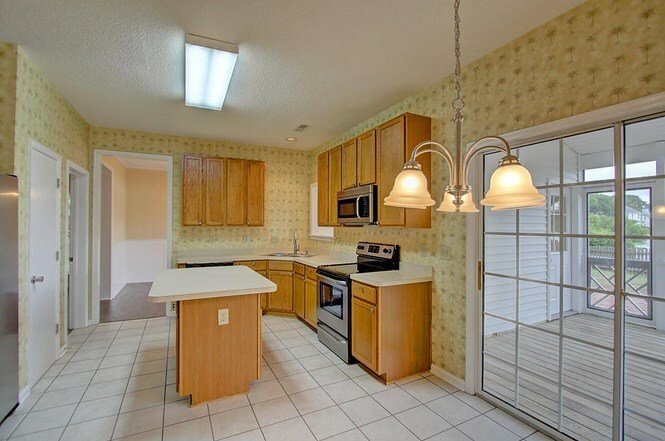 Renovating your home kitchen? Incorporate shells from a recent family vacation or glass refuse from an important celebration. The design possibilities are virtually limitless, and it all starts with creating a custom sample. Schedule a complimentary design consultation to learn more.